I came across Harriete Estel Berman’s work through the Ganoskin Orchid Gallery. What fun it was to find her fascinating and unusual pieces using what she refers to as “post-consumer” materials. Enjoy a few minutes with Harriete! My jewelry is constructed from recycled tin containers as symbols of our consumer society. The colors, patterns, words and UPC codes taken from post-consumer tin cans contribute important content. The materials are not as precious as gold or silver but in many ways reflect more accurately the values of our society. “Bar Codes” or UPC (Universal Product Codes) pervade our consumer society and cryptically identify everything in today’s marketplace. Printed on tin cans are the mysterious encrypted sequence of lines and spaces that identifies every food product, and every item that we buy. One may wonder who we really are, for how much of our identity is derived from what we buy and why we buy it? Reactions to my work vary considerably, mostly, galleries and viewers are enthusiastically positive; they love the work. 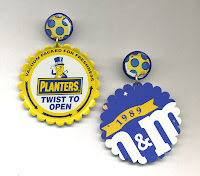 In addition, they are amazed that it is made from recycled tin cans. The down side is that most people can not conceive of wearing my jewelry saying, “I can’t wear large jewelry.” Or “Isn’t it heavy too heavy to wear?”. Personally, while I am polite, I think this attitude is ridiculously conservative. In most ethnic cultures, people wear really LARGE pieces of jewelry everyday. Large jewelry makes a statement; it identifies the wearer as being unique and engages the viewer. My favorite story is about a friend who bought an amazing bracelet to hang on her wall. She had no intention of wearing it. One night she decided to wear it to the Opera. That evening she was dazzled by the attention she received because of the bracelet! She received a myriad of compliments from people; many of whom she did not know. I get my inspiration from contemporary culture. An advertisement on TV, in a magazine or on a billboard, an article in the newspaper may all trigger inspiration. Our consumer society is filled with media bombardment and information overload. My radar is always on for insightful observation. As soon as idea comes to mind, I write it down or paste it in my sketchbook. Those moments of inspiration are fleeting, and may never come back again, but they can build on themselves. Sometimes it takes years to digest the idea or collect enough materials for one piece. What techniques do you find most interesting and what are you hoping to achieve? I am not focused on any traditional metalsmithing or jewelry techniques. As a maker, always experimenting with shapes, designs and construction, I have to invent new methods to construct my work. These innovations build on one another over the years. Techniques used to make the jewelry often funnel themselves into the larger sculptural pieces. I would like to encourage your readers to invent their own techniques and construction methods for their work. This is instead of taking another workshop to learn yet another technique. Invest the 20 hours you would spend in a workshop by experimenting in your own studio with your own work. This isn’t easy, but the rewards will be huge steps towards building your own visual and structural vocabulary which makes your work distinctive. With the economy on every one’s mind, how has this affected your business and this industry? The difficulties with the economy are depressing, but it is very hard to decipher if there has been any impact on selling my work. It never did sell well to the average consumer. People need to understand the work and the price. Each and every piece is one of a kind. Sales on Etsy have been disappointing. I think this is because the average price range on Etsy is too low, even unrealistic. The average consumer is not educated about buying quality work at realistic prices. Revenue from selling my jewelry makes a contribution to my income, but selling important (more expensive) pieces to collectors remain a significant focus for my survival as an artist. I also teach, give lectures and do silver repair for additional income. My work shows best with galleries that attract people that want the unusual. I have been honored to sell with wonderful galleries and have been part of exhibitions at well renowned museums, but it is important to keep looking for new opportunities. What advice do you have for fledgling jewelry designers? The most important thing is to have a unique visual vocabulary that does not look like any other artists or jewelry designers. You will not find your own visual vocabulary in a book or at a workshop. It needs to come from personal insight and discovery from work, dedication and bold steps. Your prices should also reflect a reasonable return for materials, overhead and labor. 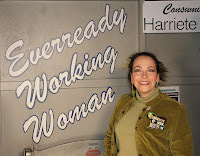 I love Harriete’s unique point of view and vision used to create her fabulous jewelry! To see more of her work, go to: Etsy, Object Fetish, Gallery at the Museum of Contemporary Crafts, Julie Artisans Gallery, Mobilia Gallery, Tercera Gallery, Heidi Lowe Gallery, Shaw Gallery and Facere Jewelry Art Gallery. Next post: Keith Lewis: Joyful Jewelry!